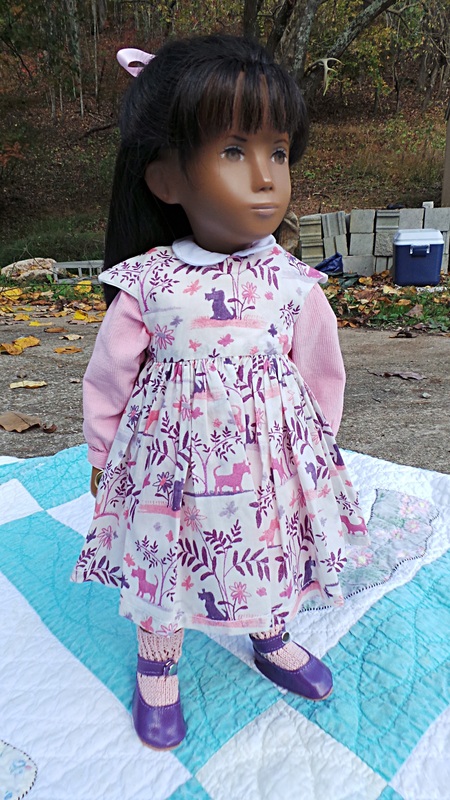 Adeline is wearing a new dress from Shelly’s site that serves as a great pinafore over her Ruthsdolls pink corduroy dress. I love the pretty pink and purple print which came with a nice matching hair tie and pants. The maker is unknown. 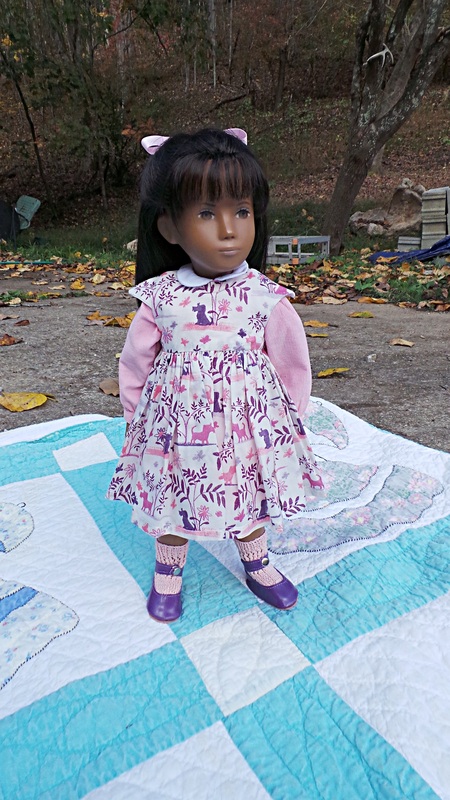 Tilly is also wearing a pretty floral dress by an unknown maker and from Shelly’s site. Tilly wears her colorful cardi by Mary Anne Getchell. Both girls are wearing brightly colored, leather Mary Jane shoes by Jean Jensen. We brought a quilt with us to soften the ground. It was a beautiful Fall day to take the photos. Tilly loves her new outfit. Her great socks were found on Shelly’s site and were made by Dollies4u. Your girls look splendid. Adeline’s dress is perfect. Oh I am so jealous of your pretty Sasha dolls and their amazing facepaint! Two gorgeous girls Ginger. Adeline looks sweet in her pink dresses, love the print on the new dress from Shellys. Tilly, also looks so colourful and warm ready to see off any chill on a winters day. Tilly’s eye’s are truly beautiful, in fact both girls are a lovely sight for a cool morning.. Your girls always look fabulous Ginger! What a bright idea to add the pink/purple print dress over Adeline’s pale pink cord dress as a pinafore. Tilly’s Autumnal colours certainly give her a warm glow. Shelly’s clothing page is a great way to buy their clothing. 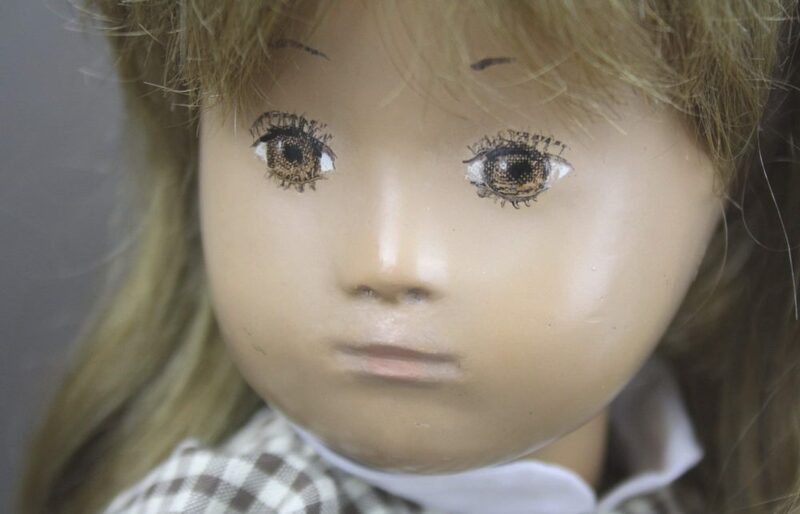 After a quick scan through the two doll pages that it where I always head next! PS. Not sure just what Denise is doing still on the computer at that time of the morning!. Me too Kendal, I go to the doll pages on Shelly’s site and then straight to the clothes pages. I try to visit often because it is enjoyable to spend time there. I think necessity is the mother of invention often when dressing the dolls. I really like the pink and purple print dress and did not want to wait to next year for Adeline to wear it. So I looked through the dresses and found the pretty pink one and was happy it worked out so well. What fun dresses these two girls are wearing and how lovely that they can get out and enjoy the day. Good idea having some soft protection for them as well! The girls do look lovely Ginger, they’re perfectly dressed for the colder autumn days….what great finds on Shelly’s site. I didn’t know you had a Rottweiller, such gorgeous dogs….I often tell Lucy my Miniature Pinscher that if she continues to try to stick her nose in the dishwasher when I’m loading it, she will likely lose her long snout and end up looking like a Miniature Rottie instead…seeing as she is the same colour LOL……funny though, it doesn’t seem to stop her!